Today I'm writing a fun, whimsical post that takes an A to Z look at customer experience. Let me know if I've missed any critical vocab on this topic. I'm happy to update. Pay attention to your customers and to their needs. Be available, accessible, and amazing. Create Apostles and Advocates. Analyze your data. And don't forget acronyms (CX, CXO, VOC, CRM, CEM, etc.). Use bigdata to glean insights that will help you personalize experiences across channels. Best practices and benchmarking are two great concepts, as well. Culture and communication are key! So is consistency. And who better to drive the customer-centric culture and keep the customer at the center of the company's decisions than a Chief Customer Officer (CCO). In addition, a centralized team to oversee the VOC efforts is needed. Discover. Design. Do. Deliver. Delight. And do it again and again. Don't forget to collect and compile various types of data (survey, behavioral, operational, etc.) to drive decisions. Display the data on dashboards. Excellent employees, empowerment, empathy, expectations, engagement, executives, EFM - o my! Customer feedback will drive customer experience design, but don't forget about feedback from employees, partners, vendors, etc. Treat employees fairly. Consider financial implications of all decisions. Good is the enemy of great. Do great things and grow the business! Hire for attitude. Happy employees = happy customers. Consider what's important to your customers when designing products, services, experiences. Ideate and innovate to stay ahead of the competition. Use feedback to improve your processes, products, and services. Remember that customer insights should drive your decisions. Journey maps are designed from the customer perspective and guide you through customer experience design. CX is a journey, not a destination. The customer is king! Know your customer. Use the Kano model to uncover customer needs for successful product/service offerings. Consider the customer lifecycle when designing the customer experience. 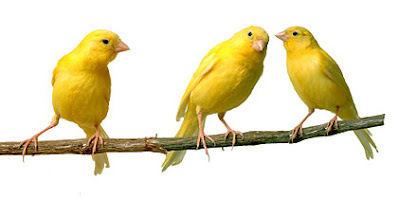 Leadership buy-in is important to the success of a VOC/CX initiative. Leadership drives the culture and sets the tone in the organization. Thanks to Stan Phelps, the CX world was introduced to lagniappe, or that little unexpected gift. What's it all for? Loyalty. Connect your customer feedback to employee feedback or to financial data to conduct a linkage analysis. Mystery shop your own stores to ensure moments of truth are being executed perfectly. Measure and monitor the appropriate metrics to ensure the customer experience is consistent and memorable across those moments. NPS, or Net Promoter System, is a commonly-used approach to tie advocacy to profitability, to segment customers, and to center organizational focus on customers. O boy. Let's see. Where is your organization on its customer experience journey? How are you operationalizing your customer feedback? The brand promise sets the expectations about the experience. Great people are key to a great customer experience. Personalize experiences to the extent that you can. Journey mapping will help you define your touchpoints and your painpoints, especially among your processes. Resolve problems quickly and resolve them correctly the first time. And then there's the big P - profitability. Ask the right questions of the right customers to get the right data to make the right decisions! Run queries to analyze your data. And don't forget to ensure quality, in feedback, financial and operational data, and products and services. Remember to recruit for attitude, but also recognize and reward your people for doing remarkable things. Respond to customers in a timely manner and make service recovery swift and painless. Run reports to analyze your efforts and to determine ROI. Build relationships with your customers. Segment customers for a personalized service experience. Conduct surveys to gather feedback about the interactions your customers have with your organization. And don't ignore social media - a great platform for customers to share feedback and for you to listen and then solve their problems. Training and re-training of your employees is important to delivering a great customer experience. Make sure they have the tools to do their jobs. Having the right technology that delivers the right insights to the right touchpoints facilitates them in their quest to service customers in a great way. Trust them to deliver exceptional service, and remember that trust is a two-way street. Undercover Boss is an awesome example of how you can keep an eye on your operations and learn how your employees are treating your customers. Use it in your organization. Have you created value for your customers today? If not, do you have a vision for creating that value? 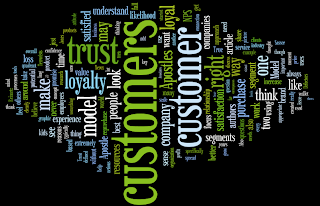 How are you using your customers' (i.e., customers, partners, vendors, stakeholders, etc.) voices to drive your important business decisions? VOC, VOE, VOB, VOM, VOP, etc. What tools are you using to visualize your data? For positive word of mouth, create positive experiences. WOW = WOM! Hey, it's all about the eXperience... your customers' and your employees'! You know what you need to do! Get started! Create a Zappos-like atmosphere by defining your values, culture, service approach, etc. On Tuesday, I took a look at the Apostle Model, which segments customers by their ratings to two survey questions: overall satisfaction and likelihood to repurchase. Today I look at another approach to segmenting customers in a meaningful way that was presented in "The Mismanagement of Customer Loyalty'' (Werner Reinartz, V. Kumar, Harvard Business Review, July 2002). In this article, Reinartz and Kumar outline their research and their approach to looking at customers segmented by profitability and loyalty; this is an important exercise to help you understand which customers to wine-and-dine and which to "ignore." I won't regurgitate the article here, but if you get a moment, read it to get the background on how they came to these segments. 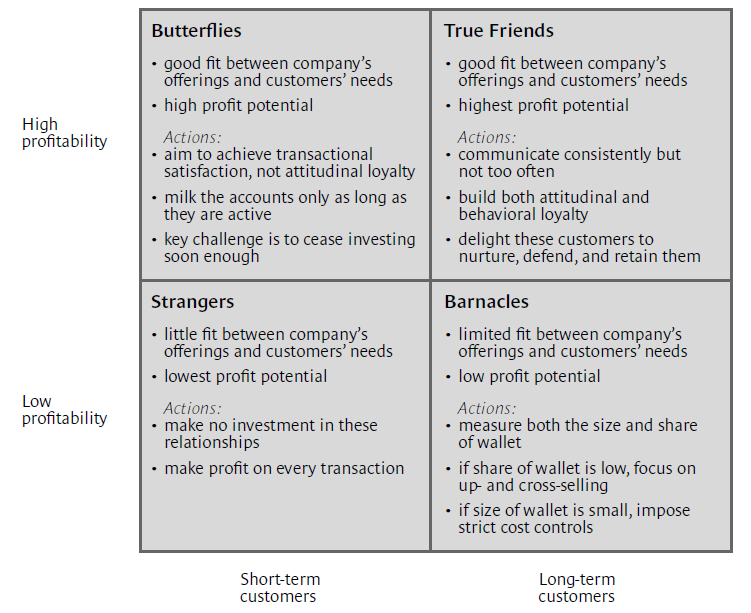 Similar to the Apostle Model, this Loyalty-Profitability Model is depicted in a quadrant chart that segments customers four ways. The chart below shows the segments and the appropriate actions to be taken for each one, according to Reinartz and Kumar. Segmenting your customers like this is a very enlightening exercise, and you can very clearly see where to focus your efforts and resources. As you can also see, True Friends are the best fit. 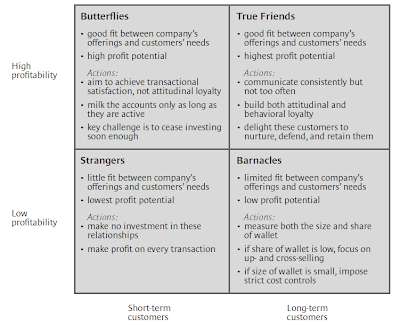 In the article, they note that companies need to focus on growing the True Believers, which are not shown in the quadrant above but are your True Friends with the highest levels of loyalty and profitability. (In the Apostle Model, they are equivalent to your Apostles; in NPS, they would be your Promoters.) They are your most-valuable customers. True Believers display high levels of both behavioral and attitudinal loyalty. These are relationships that companies really need to nurture, support, retain, and grow. Continue to delight. The Butterflies flit in, make a purchase (or purchases) at a nice profit for the company but are not committed to your brand. Efforts to convert these customers to loyal customers are typically a waste of time and resources, despite their high profit potential. But, because of that, they should not be ignored; make the transaction(s) delightful and move on. You won't be able to convert them. Barnacles can be, like their namesake, a drag on the ship. They are loyal in name but may take advantage of free services and offerings more than they actually spend money with you. They may purchase one product and call your customer support line daily, exhausting resources there without spending another dime. These require a closer look, and actions toward these customers are based on financial/profit potential, specifically on their size of wallet (i.e., value) or share of wallet (i.e., potential value). And finally, Strangers are not worth any additional effort. They likely bought an item at a steep discount and won't be back. Don't invest any resources in these customers. As noted by the title of this post, not all customers are created equal; handling the various types of loyal customers with the same approach can lead to wasted resources. It's not practical or profitable. Looking at loyal customers through the profit lens gives you a better picture of where you should focus and helps you tailor your customer relationship strategies. While at J.D. Power and Associates, we were visited by two gentlemen: Thomas Jones and Earl Sasser; they met with us about some research we were doing for Xerox. At the time, I didn't realize the significance of their presence and those meetings, but a few years later, when I read their findings and groundbreaking thinking on "Why Satisfied Customers Defect," (Harvard Business Review (c) November 1995. Sasser, Jones), I had an "a-ha moment." I remembered our meetings with them quite vividly. Subsequently, we used this model with clients when I joined CustomerSat. While NPS uses just one question (likelihood to recommend) to segment customers, the Apostle Model uses two: overall satisfaction and likelihood to repurchase. The graphic below shows the naming convention for the different customer segments, based on where they fall in each quadrant. When you look at the definitions below, you'll understand why it's important to look at customers using this two-dimensional approach: using just one or the other doesn't give you the full picture. Just because you are satisfied doesn't mean you are loyal, and vice versa. Apostles are extremely satisfied and extremely loyal; they are repeat purchasers and happily spread the good word to friends and family. These customers have an emotional connection to the brand. Near Apostles are satisfied and loyal, but not as strong as Apostles. Hostages are not satisfied but they will purchase again. These customers are typically locked into a contract or have a corporate directive telling them they must purchase the particular brand. The products may have little or no competition, or there may just be a huge barrier/cost to switching. Terrorists are extremely dissatisfied and extremely disloyal, i.e., they will never purchase again. These customers are your worst nightmare; they'll share their dissatisfaction with their 10,000 friends! The beauty of this model is that it provides a robust way to segment and understand customers, and it can help you take appropriate action by company, customer, industry, etc. Let's look at how to prioritize addressing these segments. Keep in mind that it's cheaper to retain customers than to acquire new ones. Priority #1: Address the Defectors, especially Terrorists. This may mean figuring out how to "fire them" the best way possible (so they leave but don't spread more ill will), figuring out the ROI of fixing their issues (may not be worth the time or resources), or designing a win-back initiative to turn them around. Be sure to understand why they've landed in this bucket - changing needs could be addressed in a cost-effective manner that will allow you to turn these customers around. They complain more frequently and can and will drain your resources, so move quickly to figure out an action plan. Also, if they do leave, they will share their reasons and experiences - and with social media, we know that the megaphone is on. They represent an extreme potential for negative value for your company. Priority #2: Focus on your Apostles and their needs. For obvious reasons, you want to keep and grow this segment. They want to help your business succeed; that emotional tie they have achieved means they are now encouraging others to use your products and services. Facilitate community building for these folks. And don't forget to regularly thank them for their business. Priority #3: It is worthwhile to do whatever it takes to bump your Near Apostles up to Apostles. The slope of the curve where they fall is steeper, meaning that a small increase in satisfaction can yield a big increase in loyalty. Of course, you want to grow your Apostle segment, and this segment is the easiest to address to do that. Priority #4: As little control as you may have over Mercenaries, the best way to ensure that they stay is to communicate the value they receive for the price they are paying for your product. Remind them of the benefits; after long periods of use, customers may forget and only think price. Also ensure that they are using the right product or service for their specific needs. Priority #5: Hostages, who are exhibiting a false loyalty, should also be addressed because someday they may be scooped away by competition. Understand their needs, their reasons for dissatisfaction, and work through it with them. Communication is a key retention strategy for this segment. Again, cheaper to keep the customers you have. You can see from the priorities that, similar to NPS, you want to reduce the percentage of Defectors and increase the percentage of Apostles. Also like NPS, this model works for employees, too. This model is by no means perfect, and it has its proponents and opponents. One of the arguments against this model is that, because the segments were never clearly defined (e.g., Loyalists are Osat = 4, 5; LTP = 4, 5), it (a) is misused and (b) combines scores that should not be combined. The authors used a 5-point scale, but in the graphic in both the article and in The Service Profit Chain, where they also discuss this model, they never labeled the exact points that fall into the buckets for each segment. The issue it raises is that, as they state, a customer giving Xerox a 5 on overall satisfaction is six times more likely to repurchase than a customer who rates satisfaction with Xerox either a 3 or a 4. So these customers cannot be lumped together. At CustomerSat, we used a 10-point scale and created our own definitions around that scale (based on our findings) to mimic the spirit the authors were outlining in their graphic. Keep in mind, though, and I have not mentioned it yet, that the authors also noted a "Zone of Indifference," which is basically a super-segment that excludes Terrorists, Apostles, and Near Apostles (loosely - again, values are not clearly defined). 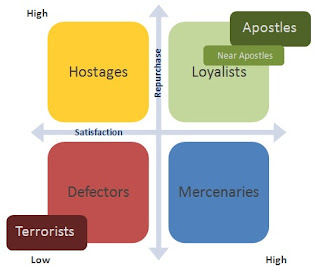 Basically they are saying that those three segments are your main focus ... again, like NPS: reduce Terrorists, increase Apostles. While the original model uses likelihood to repurchase as the loyalty question, the authors wrote about an updated model in 2003 (The Value Profit Chain. Heskett, Sasser, Jones) that incorporated likelihood to recommend, or "referral value," as they called it. My personal opinion... every model has its pros and cons. The key to using these models is that it gets the organization to focus on the customer, specifically, different kinds of customers: what makes customers happy, what doesn't. Most important is to look at the experience from the customer's perspective, figure out what it will take to fix whatever processes or operations are broken (creating Defectors), and make it right while at the same time continuing to do the things that delight customers (creating Apostles). My favorite thing to say is that it takes the right people, the right tools, the right data, the right touchpoints, the right processes, and the right culture to get the organization focused on the customer experience. Consider using a loyalty model such as the Apostle Model as one of the tools in your tool belt. I started out wanting to make this post about writing thank you notes (I'll still share my thoughts on that another day), but the bigger picture is about teaching kids some of the fundamentals of "being nice." We always talk about "hire for attitude and train for skills," but the attitude comes from somewhere. It's never too early to instill those manners in our kids. Being polite probably encompasses all of it, but I'm referring specifically to saying "please," being kind and courteous, helping others (either proactively or reactively), asking others how they are doing, being honest, and looking the other person in the eye when talking to them. Appreciating what you have or get can be summed up as "attitude of gratitude." Saying "thank you" is the most basic form of this. Beyond that, regardless of the circumstance, you can always find something to be grateful for. In the CX world, the first and foremost example of the latter is: "A complaint is a gift." Listening is a tough concept to teach kids; they don't know it at the time, but it pays off in spades in the future. You can learn so much when listening to others: about them, about yourself, and about the world around you. Not only that, but it's respectful. "You have two ears, two eyes and one mouth. Use them in that proportion." Apologizing when you make a mistake or hurt someone is a lesson many companies have had to utilize lately. Be genuine and sincere. To prove you are sincere, don't repeat what you did. Don't make excuses. Take ownership. Be accountable for your actions. "Apology is a lovely perfume; it can transform the clumsiest moment into a gracious gift." I'm not preaching; I've just been doing a lot of thinking about what we need to do to turn this customer experience thing around. We talk about it a lot, and various initiatives and efforts are implemented, but we still see statistics like, "Two out of three consumers switched providers during 2011 as a result of poor customer service, even though they were more satisfied with those companies than in the year before." These initiatives are failing. Then there's this statistic: "86% of respondents said they'd pay a premium for better service." Well, that's great, but first companies and the people who work in these companies (remember, people buy from people) need to understand the source of a better customer experience. Anyway, if better customer service and better customer experiences are not going to happen in our lifetime, let's at least pass along the right tools to our kids so that they can reap the benefits of our hard work today! Last year I gave a presentation titled, "Top 3 VOC Best Practices." I started off the presentation by asking the audience to give me some of their best practices - and then I moved into my top three: communication, communication, and communication! It's probably not what most people expected when they saw my presentation listed on the event agenda, but I think they left the session understanding why communication is mission critical to the VOC efforts from a variety of angles. 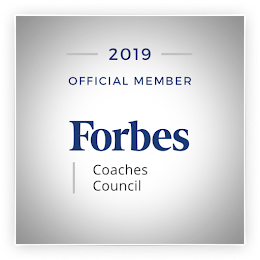 Communication is an extremely important part of creating a customer-centric culture, as it opens the door to an open and honest relationship with all stakeholders (executives, employees, customers, etc. 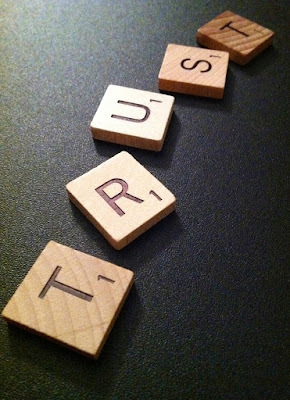 ), begets trust, drives understanding and accountability, promotes participation, establishes a foundation for meaningful change, and leads to a successful outcome. 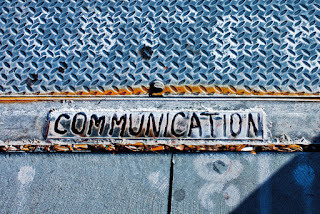 In short, communication breeds commitment. 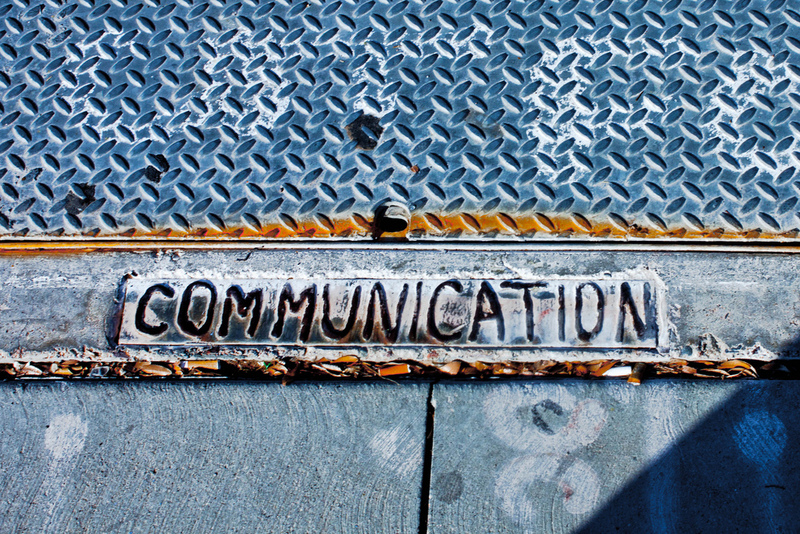 In your VOC efforts, communication has five broad objectives. Different objectives may apply to different audiences. Instruction: Share information or teach stakeholders about the initiative, its purpose, the feedback, the insights, the service recovery workflow, process changes, etc. Motivation: Inspire or motivate your audience to do something or to act in a certain way, whether that's inspiring your employees to create a customer-driven environment or motivating your customers to stick with you, try your next product, etc. Adoption: Convince your audience or get buy-in, e.g., executive or frontline buy-in. Align the audience with the mission. Discussion: Drive open and candid discussions with your employees, customers, and other stakeholders; close the loop. Encourage employees to share their ideas and concerns. Expectation: Most importantly, set expectations. Recall that Performance - Expectations = Satisfaction. This applies both to employees and to customers. Fail to plan... plan to fail! The solution: a Communication Plan. I've used these with clients over the years, and they are a great way to outline the various communication needs for your VOC initiative. The graphic below shows just one example of a layout for your plan, but you can modify it to meet your needs. My sons are 7 and 10 and have their Brown Sr. belts in Taekwondo. 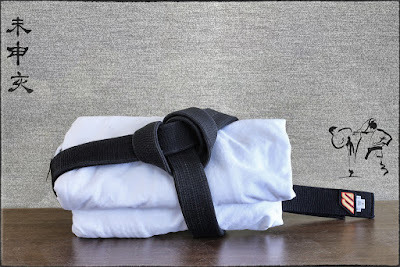 They are members of the Black Belt Club, which means they show a Black Belt attitude, and attend classes two times a week. As I sit and listen to their Master Instructor talk about the principles of Taekwondo, I always draw the connection between those tenets and the customer experience. (It's a hazard of the profession!) He teaches these principles, as well as self-confidence and respect, because his goal is to create leaders. I love that! What a great age to start teaching kids what it means to be a leader. In class this week, their Master Instructor talked about Loyalty, and I thought, "OK, I can do this. Let's get it down on paper!" "As a true martial artist, you must put these principles into practice every single day of your life, as well as at the Dojang, so they become part of you as a person." If companies practice these principles in their business dealings, then they become part of the fabric of who they are as organizations. That alone should create lifelong, profitable relationships with their customers. And, by the way, these are great values to practice as leaders and to look for, or instill, in employees. Being humble and not becoming bigheaded no matter what your achievements means that you do not become satisfied with your technique. As soon as this starts to happen, you become complacent with your performance. This refers to your voice inside that tells you to practice continually until you are more at ease with the technique. Having the right attitude and maintaining inner strength regardless of winning or losing. Not allowing one's principle to be broken, defeated, or conquered. When bad times strike, that spirit in you won't be crushed. Keep trying. Go further than you ever thought possible. Martial arts techniques are difficult and can never be fully mastered. Perseverance reminds us that there is always something that can be improved, no matter how flexible or technical you are. It means to never give up, no matter how hard things are, to persist in an endeavor in spite of counter-influences, opposition, or discouragement. You can do anything you want, if you keep trying. This one is a no-brainer as it relates to customer experience, but here's what they say about it in Taekwondo. Loyalty should be a two-way system: instructors should be loyal to students, and vice versa. 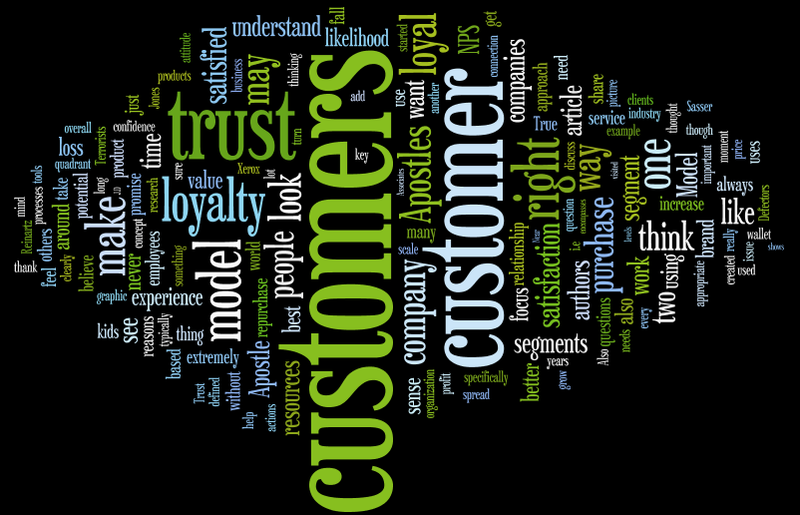 (Customers are loyal to companies, and companies should reciprocate.) Stay true to your friends. Tell the truth. Be honest and stand up for what you believe in. Never let someone else's standards and morals affect you unless you believe in them yourself. The only way to make a true decision is by gaining as much information as you can and making up your own mind. Trust and credibility lead to loyalty. Without etiquette, the whole martial art philosophy, which is built on respect, would collapse. Hopefully by learning respect inside the Dojang, students will continue to practice outside of the Dojang and become more respectful as a person. Enduring respect for, and consideration of, self and others. Being polite, even to people you find it hard to be around or those rude to you. Listening to others. Steadfast adherence to a strict moral and ethical code. Honesty. Doing the right thing. Doing what you say you are going to do. Ability to exert your will over your inhibitions, impulses, emotions, and desires. Control yourself so you don't harm others. Patience. Discipline. Staying focused. Not veering down the wrong path. Treating others with kindness. We show respect at the Dojang by showing good eye contact with the instructor when he is talking. We always reply, "Yes, sir" or "No, sir." And we bow. I think it's easy to see how each of these principles can apply to leadership, your company culture, and the customer experience. I welcome your feedback on these posts. Feel free to suggest other topics in the survey arena that you'd like to read about. I've listed below my top five blog posts for the month of January based on views and tweets. Thank you so much for taking the time to stop by, read what I write, and share with your friends and followers. If you have thoughts for other topics you'd like me to write about, please leave a comment below. Stay tuned for more exciting topics in February!